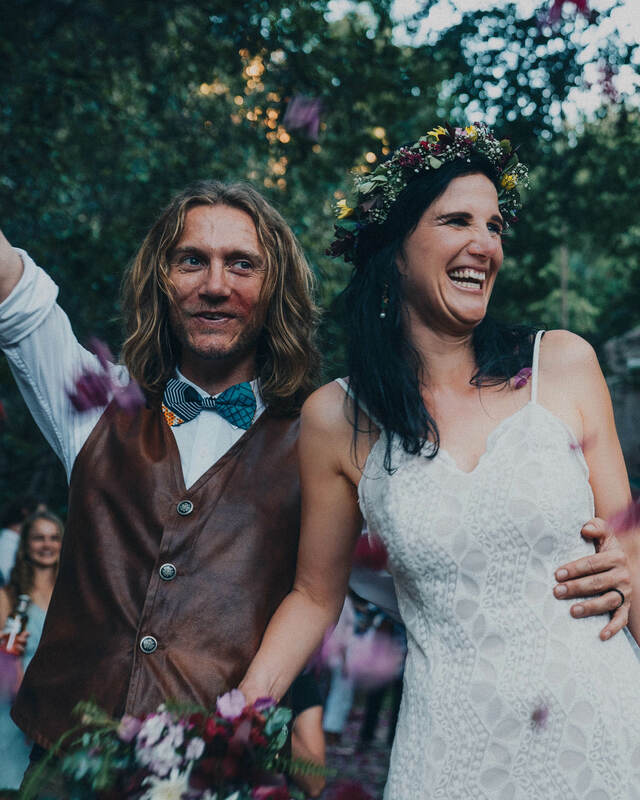 When bride Alda had a literal dream of her dream wedding to Sydney, the rest was easy when it came to preparing their ultimate forest-themed day. As kids, we used to go to this waterfall at Enselsberg near our family farm. We called it ‘the jewel of the Marico’, because it was completely hidden away on the side of a mountain. In my endless search for a wedding venue, I had a dream that I was back there – I knew that it would be the perfect setting for our big day. The next day, we phoned the owner, who very excitedly gave us permission to host a wedding there. Aside from two chalets, a campsite, one ablution facility and a small lapa, there is nothing else except the waterfall and a fairy-tale-like forest. With the nearest town 40 km away, we would have to build, transport and do everything ourselves. 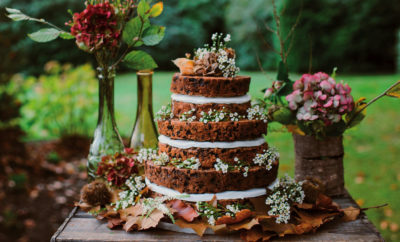 We pulled together as a family and became a do-it-yourself wedding-planning machine! 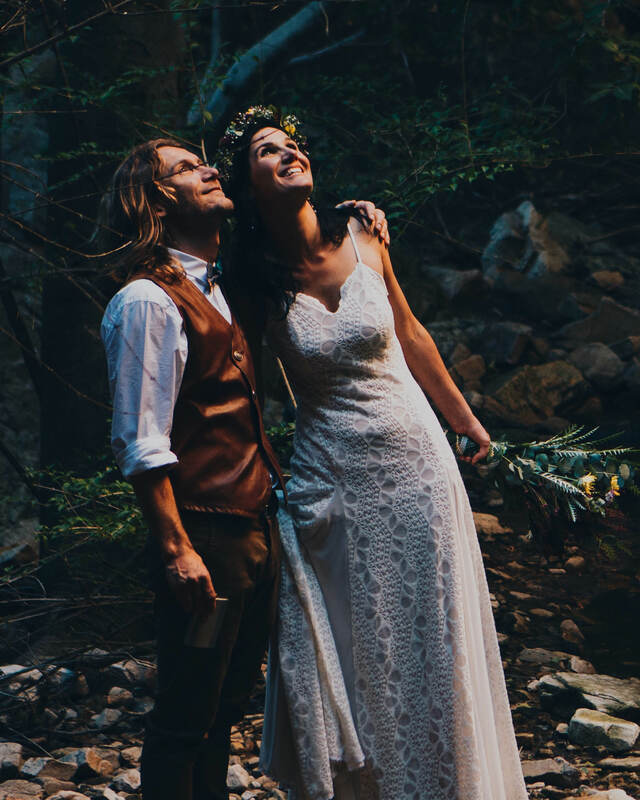 As nature-loving, adventurous people, Sydney and I decided that our wedding would be nature-themed. We also drew inspiration from our recent travels to India, our South African heritage and outdoor music festivals. My dress was made by a friend. I didn’t want a traditional gown, but rather an elegant dress that was simple with a distinct bohemian flow. It was made from stretch lace, and featured ethnic lines that were perfect for our theme. I wore a pair of leather sandals, and they made my walk through the kloof a breeze. 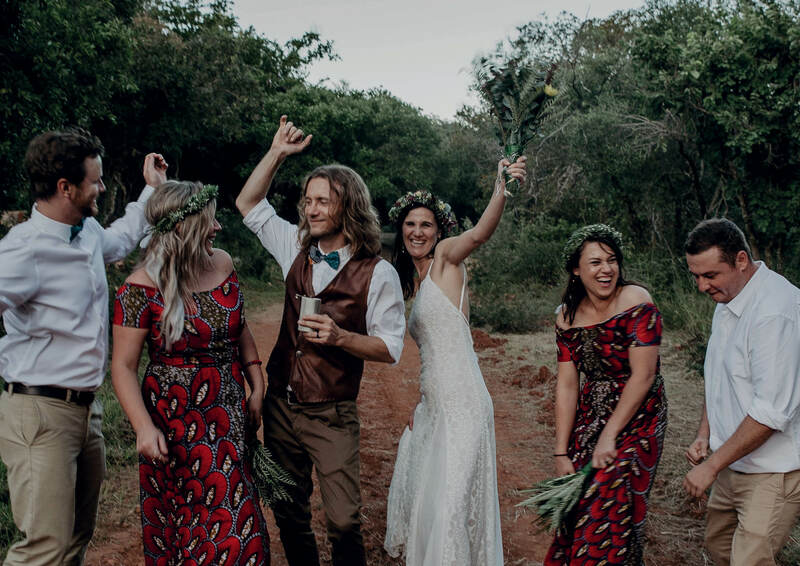 My bridesmaids’ dresses, which were made from an East African wax cloth, were created by a very special lady I work with. Because of the location, we didn’t really have to do much with the decor. 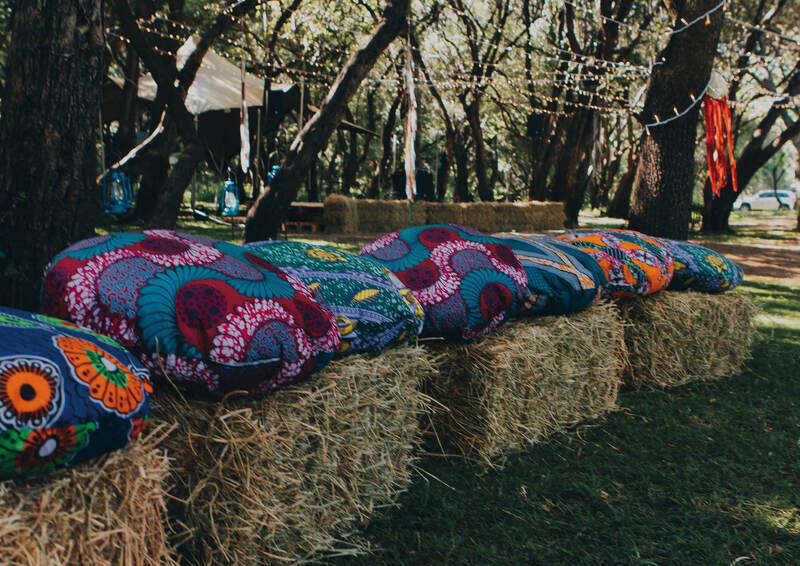 We had colourful pillows on the hay bales at the bar and decorated the cheese table with East African fabric. 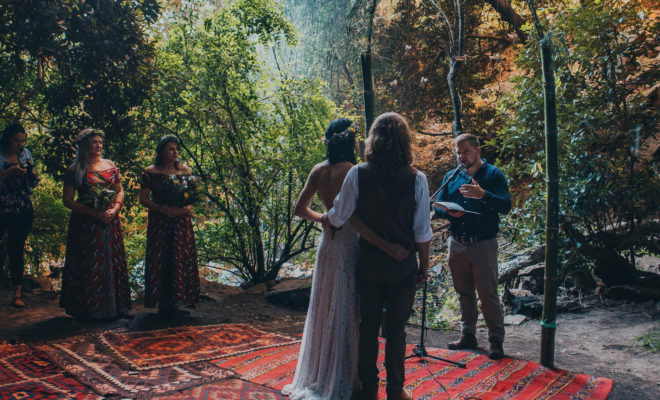 We had our ceremony in a cave behind the waterfall. There were a lot of puddles everywhere, so my mom covered them with water grass, making it look like a natural water feature. Sydney built the arch we got married under with bamboo that grows naturally in the area, and we decorated it with wooden birds. We hung one massive dreamcatcher and 50 smaller ones all over the venue – we also made these ourselves. Back at our reception area, we hung plenty of fairy lights and decorated the tables and chairs with candles and greenery. 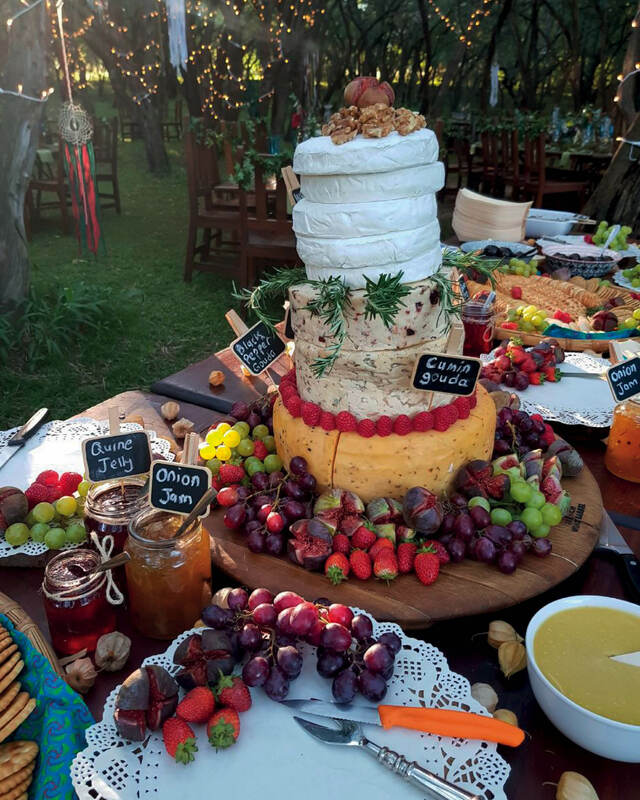 After the ceremony, we welcomed our guests to the reception with white-wine sangria, a cheese table, and our cheese wedding cake. 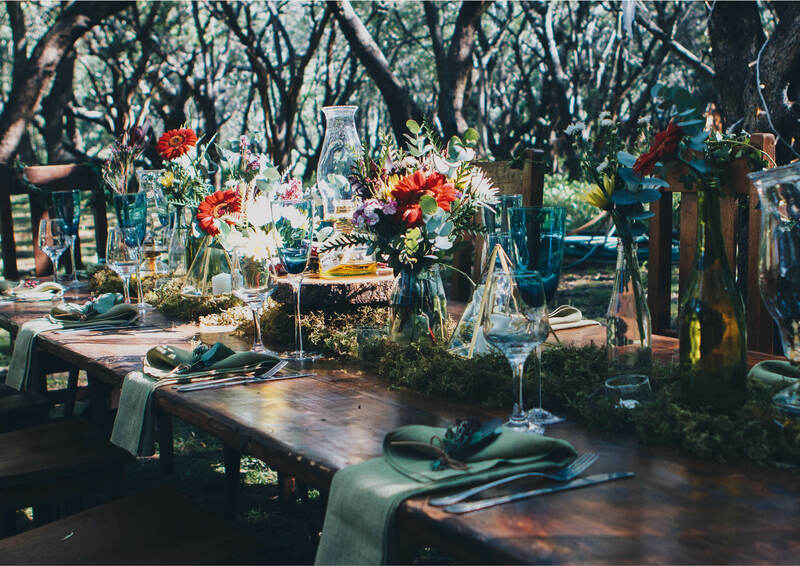 Considering we wanted to serve an authentic bush banquet, we didn’t go for anything too fancy for the main meal. We love Indian food (and knew our guests would too), so we served three wonderful curries: lamb, chicken and veggie. We aren’t big on dessert, so we just asked a local coffee shop to serve coffee and my aunt baked mini dark chocolate cakes to serve with it. Ever non-traditional, we didn’t have a first dance. Instead, we treated our guests to a beautiful performance by our friend Alwyn Bekker from Bad Peter. The Oh So Serious band then opened the river sand dance floor to us and our guests. They were followed by our not-wedding-DJ friends, who added to our music-festival theme with some wonderful swing party vibes. But if we did have a first dance, I would have liked it to have been ‘Special Star’ by Mango Groove. We saved a lot of money by not hiring a wedding planner or an expensive venue. All the DIY work was done by us and our friends and family. Making use of local vendors in the area also saved us a lot of money. I am very lucky to have a dad who is a farmer, and he provided all the meat at cost price.